Cupcake, oh cupcake, how I've neglected thee. 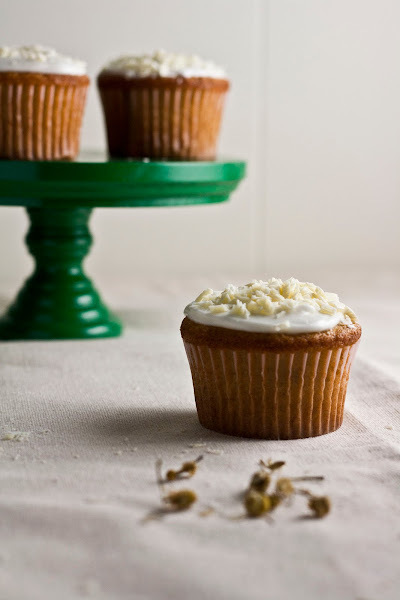 When I first started this blog, I baked nothing but cupcakes, baking through my favorite cookbook (and namesake), The Hummingbird Bakery Cookbook. But now, whither the cupcake recipes? The last cupcake recipe I baked, tiramisu cupcakes, was back in October. Pretty pathetic, considering cupcakes are allegedly my favorite dessert. But I think I know what happened — there was a while in which I was obsessed with trying out new recipes from foodgawker.com. I even kept a really detailed Google Doc full of them. But here's the thing: the list contained hardly any cupcake recipes. Why? Cupcake recipes on foodgawker are either far between or simply blah. Okay, to be fair, by blah, I really just mean your standard classic flavors like vanilla/chocolate/red velvet... good, yes, but stuff I'd already made. I wanted to try something new, something exciting, something unique. I'm lucky enough to live in Portland, Oregon, where ridiculous* things like artisan supermarkets and specialty food stores are in abundance. *I say ridiculous, because yes, as much as it pains me to admit it, that show Portlandia is sometimes painfully accurate. But god knows how much I love it here, especially with all the artisan supermarkets and specialty food stores, and how lucky I am to live in a place like Portland. And one of my biggest weaknesses is, yep, artisan chocolate. And you'll bet that every supermarket a stone's throw away from me sells a ton of such chocolate — you know the kind. Gourmet, small batch, local, fairtrade, buzzword, buzzword, etc. One of my recent discoveries is a brand called The Tea Room, that sells tea-infused chocolates. Yep, you heard that right. Tea-infused chocolate. I know, I know, my life is so Pinterest. I've tried most of their flavors: milk chocolate infused with jasmine, dark chocolate with Earl Grey, so on. And as I was scarfing down my favorite, a white chocolate bar infused with honey and chamomile, I thought to myself: wouldn't this make a great cupcake? And yes, yes it did. 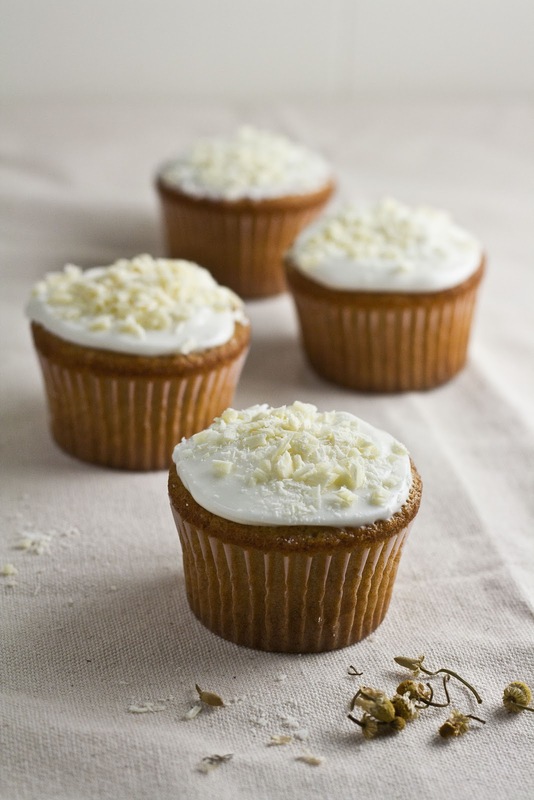 Now, I started out by searching my usual food sources to see if a recipe for white chocolate, honey, and chamomile cupcakes already existed. 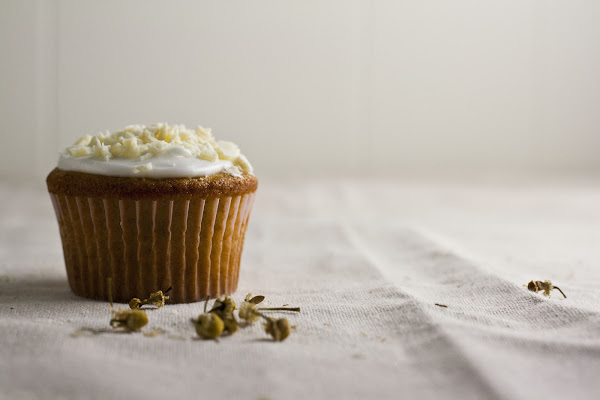 The closest I found was a recipe for honey and chamomile cupcakes from the renowned and much beloved Joy the Baker. I eagerly whipped up a batch but found her cupcakes to be too... well, grainy. Don't get me wrong, I love Joy, but these cupcakes weren't what I was looking for. The problem was, she'd left the chamomile tea leaves in the batter, leading to an odd texture that reminded me of banana bread. Good, yes, but not the fluffy and delicate crumb I seek in a cupcake. So it got me thinking — what if I followed my beloved Hummingbird Bakery Cookbook's trick (as seen in their recipe for lavender cupcakes) and infused the milk with chamomile tea instead, leaving all the flavor of the tea but none of its grit behind? It worked wonders. The cake was light and fluffy, but with a strong flavor of chamomile complemented by honey and white chocolate. This cupcake is like a cup of warm tea on a cold winter's day. A steady reminder that, when in doubt, always trust the Hummingbird Bakery Cookbook's method. They know what's up. Please note you'll have to make the chamomile infused milk a day in advanced for this recipe; but rest assured that it's worth it. Put the 1/2 cup whole milk and 3 tablespoons dried chamomile flowers in a liquid measuring cup, cover with plastic wrap, and refrigerate for at least 3 hours, but preferably overnight. Bring to room temperature before using. Preheat the oven to 325 (F) and prepare your cupcake pan with paper cupcake cases. Put 1 cup flour, a scant 3/4 cup sugar, 1 1/2 teaspoons baking powder, and 3 tablespoons unsalted butter in a freestanding electric mixer with a paddle attachment (or use a handheld electric whisk) and beat on slow speed until you get a sandy consistency and everything is combined. Strain the 1/2 cup of chamomile-infused milk for the cupcake (from the first step) and slowly pour into the mixture, beating well until all the ingredients are well mixed. Add 1 egg and beat well, scraping any unmixed ingredients from the side of the bowl with a rubber spatula. Once all the ingredients have been incorporated, spoon the batter into your prepared cupcake pan until each paper cupcake case is about two-thirds full (if using a cookie dough scoop, each cupcake case should have about two tablespoons of batter) Bake in the preheated oven for 20-25 minutes, or until the tops of the cakes bounce back when touched. A skewer inserted in the center of the cupcakes should come out clean. In a medium bowl, whisk together 1 1/2 cups powdered sugar, 1 tablespoon honey, 5 tablespoons heavy cream, and a pinch of kosher salt together until smooth. Use a cookie scoop to evenly distribute glaze amongst the cupcakes, using an offset icing spatula to smooth the glaze evenly across the cooled cupcakes. 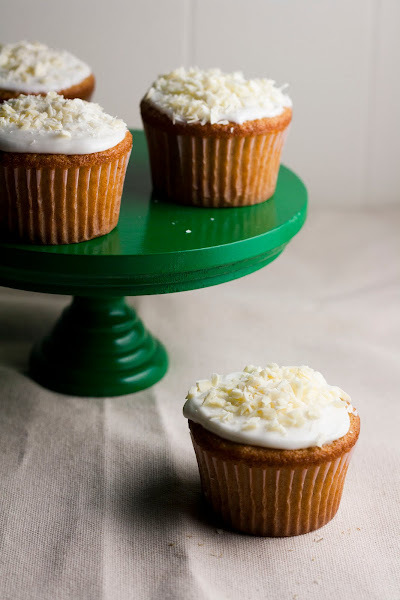 Once the cupcakes have been frosted, use a cheese grater or a vegetable peeler to create white chocolate shavings over the cupcakes — do this immediately after frosting the cupcakes, otherwise the glaze will set and the white chocolate shavings will bounce right off the cupcakes. What a lovely flavor combination! It's true, Portland is sometimes a little too accurate... I often forget that Portland's quirks are unique and that other cities do things differently! 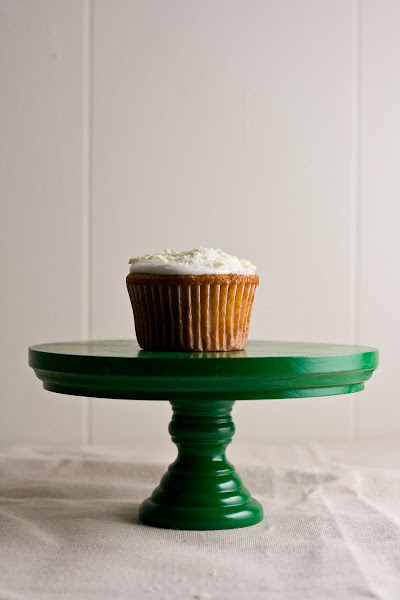 Portlandia highlights our weirdness... ;) Also love the green cake stand! I'm intrigued! I can't even remember if I've ever had chamomile, so I can't really even picture what this would taste like. But your shots are absolutely gorgeous. The last one is my favorite. Oh. My. Heavens! These look and sound amazing! that sounds like a great combination of flavours!! i wish the topping was an actual white chocolate honey frosting rather than a glaze though, have you tried making any white chocolate frosting? Hi Christian, this is for sea-level! All my recipes these days are at sea-level, unless stated otherwise. Enjoy! yum! thanks for sharing the link in your feedback (on etsy). love to see the stands in use!